All over the internet, people claim that broomball was invented in Iceland a thousand years ago. And then disappeared until it arose again in Saskatchewan in 1909. Or maybe Duluth in 1910. 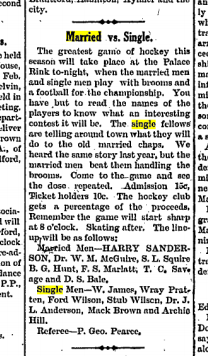 While the picture above of the Ladies' Broomball Team in Petrolia, Ontario in the 1890s, is delightful, we in Waterford wish to lay claim to having among the earliest written references to broomball (if not by that name) in the modern age. Any player falling down while not after the ball shall be penalized. Players hitting the ball and missing it will get one minute on the boards. A player raising his broom more than one foot above his head shall be put on the boards. Players must not kick the ball with more than one foot at a time. The brooms must be not less than three feet nor more than six feet long. A player holding on to the boards or another player to keep from falling down will be penalized. Player wearing shoes larger than No. 10 are disqualified. Players will get two minutes for sitting on the ball. Any player breaking a gas jet must settle with the rink management. Any player hitting the referee will get six months. 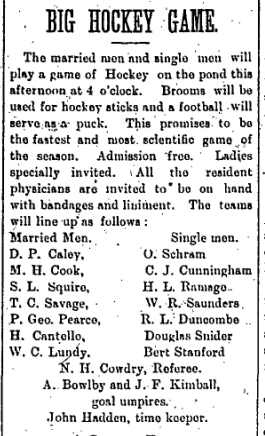 This item seems to be the first broomball game recorded in Waterford -- perhaps in the world! The referee Mr. John Hadden, was rather severe and often had three or four up against the boards at a time. The ordinary whistle was discarded and a dinner bell used, which could be heard several blocks. 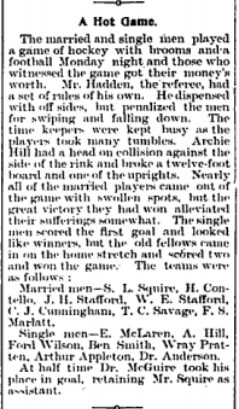 ... Mr. N.H. Cowdry acted as time keeper and he became so interested in the game and was so busy keeping 'tab' on the boys who got two minutes that he did not call the game at the half-hour but let them play an hour. These two teams will not likely play another game this season as it will be impossible for the married men to get into condition before the ice leaves the pond. I've expended a lot of effort to collect, assemble and display this stuff. If you want to use it, all I ask is a link back to this site for online use and bibliographical citation for written use.